Everyone calls April “Dog.” She’s been bullied all through high school. From being forced to eat a whole box of dog biscuits and retching in the hallway to being beaten within an inch of her life, April has endured the unendurable quietly, hoping to disappear from the Beckoners’ radar. The only good thing in her life is her real dog, Shadow, who follows her everywhere (‘shadows’ her) and loves her without reserve. Zoe is the daughter of an alcoholic mother (Alice) who jumps into and out of relationships with various men. She spends a lot of time listening to self-help tapes and uses the jargon not to help herself, but rather to point out how others can help her and themselves at the same time. Along with Zoe’s baby sister Cassy, the family of three is always on the move. Zoe is primarily responsible for Cassy as Alice is usually off with a man, hung over, or at work. When Alice moves her family of three to Abbotsford, Zoe is picked by the Beckoners, headed by Rebecca “Beck” Wilson, to be one of their gang. The fact that Zoe falls in with them is a matter of circumstances. She never wanted to be a part of a gang, and she is sickened by some of the vicious things they do, particularly to April. But she’s afraid not to join, and, once in, she doesn’t know how to get out without risking her life. The last girl to try had her head shaved and tattooed, after which she disappeared. Zoe is able to make a few real friends. There are Simon and Teo, a gay couple who have their own set of problems fighting prejudice, but who understand just how much trouble Zoe is in. And there’s also Leaf, the editor of the school newspaper. When Mrs. Henley, the English teacher, has an anonymous essay contest to pick the next editor of the paper, April wins. This throws Zoe and April together, even though Zoe has helped to antagonize April in order to stay in Beck’s and the other Beckoners favor. 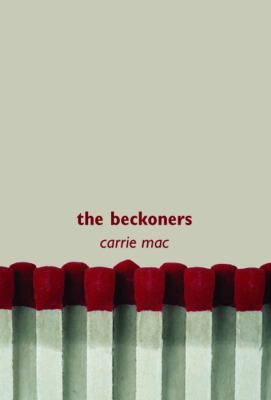 Mac does a great job of building the tension in The Beckoners. What happens to Zoe and April continues to build in danger as Beck appears to be something of a psychopath. The final torment of the girls, particularly April, is tragic. This is a true bullying book and very realistic. I recommend it for all teens. High school housekeeping: Carrie Mac is the author of several books in the Orca Soundings series for reluctant readers. The Beckoners is a step up in difficulty from these books. For teens working to improve their reading skills (Read 180, etc. ), reading this novel is a great opportunity because you’ll have an author that you know and like, a subject that is riveting, and you’ll see how well a character can be developed in a work that’s a bit longer. This is a great read for all teens, but I’m particularly going to talk it up to those working on improving their reading skills. One minor criticism (and it is minor): I think that two of the main characters have names that are too much alike—Alice and April. Sometimes I was reading and then realized I had the wrong character in my mind’s eye. My reading of the book would have been smoother with different character names. This entry was posted in Faith-Based/Religious Element, Family Problems, Fiction, Human Rights Issues, Read 180, Young Adult Literature and tagged bullying, gangs, girl gangs, high school students, YA fiction, YA literature. Bookmark the permalink.